Explanation: To some, it may look like a portal into the distant universe. To others, it may appear as the eye of a giant. Given poetic license, both are correct. 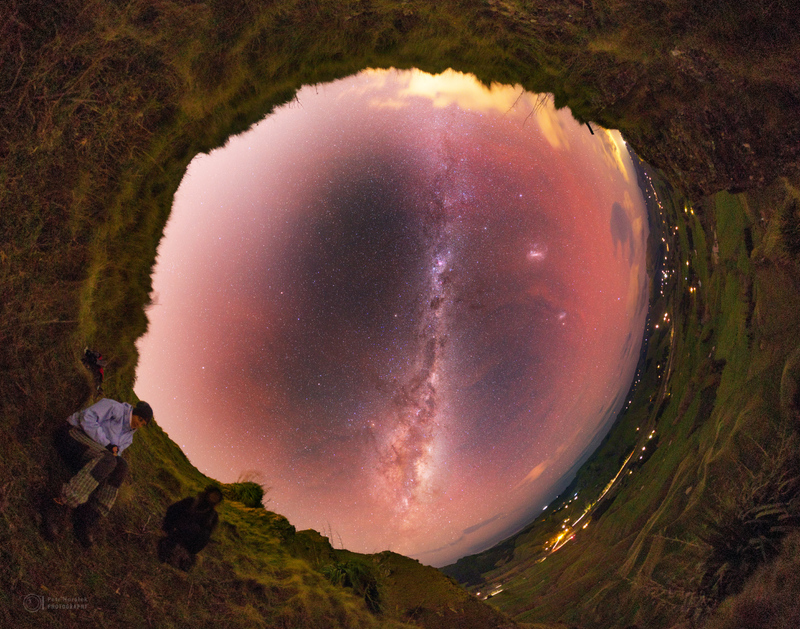 Pictured above is a standard fisheye view of the sky -- but with an unusual projection. The view is from a perch in New Zealand called Te Mata Peak, a name that translates from the Maori language as "Sleeping Giant". The wondrous panorama shows the band of our Milky Way Galaxy right down the centre of the sky, with the Large and Small Magellanic Clouds visible to the right. The red hue is atmospheric airglow that surprised the photographer as it was better captured by the camera than the eye. The above image was taken two weeks ago as the photographer's sister, on the left, and an acquaintance peered into the sky portal.